As it turns out, Chemistry Sets do not have preset formulae. Instead, they are pseudo-random in their requirements. A Steam update today fixed a host of bugs, including one that caused the Steam client to become stuck in Offline Mode or Online Mode. So those of you who have ever tried to use Steam during or after loss of internet access, you *shouldn’t* be locked out from using Steam. This fix has been a long time in coming. (Aug 28) Fixed the Linux dedicated server failing to run on older Linux versions, and some Linux HUD bugs/crashes. This is why most of TF2Newbs’ servers have been down. Thank you for your patience. (Aug 20) Wearing the Hardy Laurel triggers “Romevision” in MvM mode, which changes the appearance of the bots. Anyone in the same server with someone wearing the Hardy Laurel can opt-in to “Romevision” (can be disabled in Advanced Options). The in-game player status panel now shows an animated image of your character with its current loadout (can be disabled in Advanced Options). Bots can now reflect energy-based projectiles, and have improved pathing behavior around ramps. The hats Foppish Physician and Distinguished Rogue are now team-colored by default, and are now paintable. Crate #56 and Salvaged Crate #50 no longer drop. Crate #71 and Select Reserve Crate #60 now drop. The current Crate Drop List is now 57, 58 (Robo), 59, 60, 71. Also, Summer Claim Checks are a rare drop, granting one crate from #61-69. Evidently, a name change from Salvaged Crates. Rare drops similar to a salvaged crate. Instead of a Chemistry Set, this is a ready-to-use Strangifier that can be immediately applied, like Bacon Grease to a Frying Pan. Chemistry Set is a one-use tool item that, when combined with a series of items, creating a Strangifier tool. The list of items that trigger the creation of a Strangifier tool varies, being somewhat random. It appears that every Chemistry Set recipe will consume a several Unique (yellow) weapons, and perhaps hats, stranges, and/or Botkiller weapons. I believe that there are “templates” that randomly determine the items that make up the recipe. For instance, one formula will require multiple pairs of hats. Another will require some weapons and a strange. Another will require some weapons and a specific type of Botkiller weapon. The Strangifier tools themselves can be named, traded, and gifted. 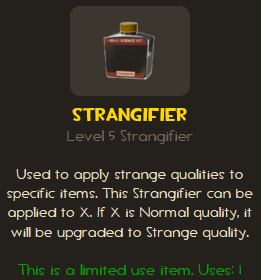 Strange Bacon Grease’s item type has now changed to Strangifier. Fixed bug causing Jarate and Mad Milk from applying to all targets in range (!). Fixed bug causing Marked For Death icon to stay in world after the affected player died. Fixed bug allowing Spies to explot Kunai’s higher overheal limit. Fixed bug preventing the Medigun’s “Share Power Ups” upgrade from working correctly in MvM. Fixed backpack images for the Valley Forge and the Founding Father. Fixed an incorrect path for downloaded custom player sounds. Fixed duplicated support/mission icons in MvM HUD. 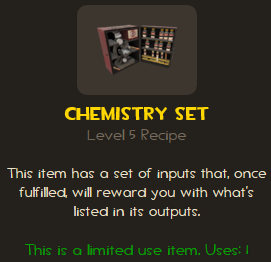 So, what’s with this Chemistry Set? As of this launch, there are 13 Chemistry Sets. Each provides a recipe of items required in order to create a Strangifier earmarked for a specific item. Then, you use the Strangifier on that specific item to add the Strange quality to that item. By the way… all of these recipes will require either an existing Strange item, Botkiller Stranger weapon, hats, or both. If the target item is Unusual, it will become Strange Unusual and retain the purple text and other effects of that unusual, including name tag, etc. I believe the same also occurs with other quality items (e.g. Vintage). Finally, these Strange cosmetic items have a point counter–global admin Crap has informed me that they count scoreboard points you’ve tallied. Yes, that’ll go over 9000 pretty quickly while pushing the cart. Note: “Select Reserve” Crate #60 can drop a Pomson 6000 Strangifier. So the Pomson can be upgraded to Strange without a formula–you just have to get one from a #60!! This entry was posted on Tuesday, August 27th, 2013 at 7:41 pm	and is filed under News. You can follow any responses to this entry through the RSS 2.0 feed. You can leave a response, or trackback from your own site.